Living in the South, we’re lucky that we can use the outdoor grill year round. 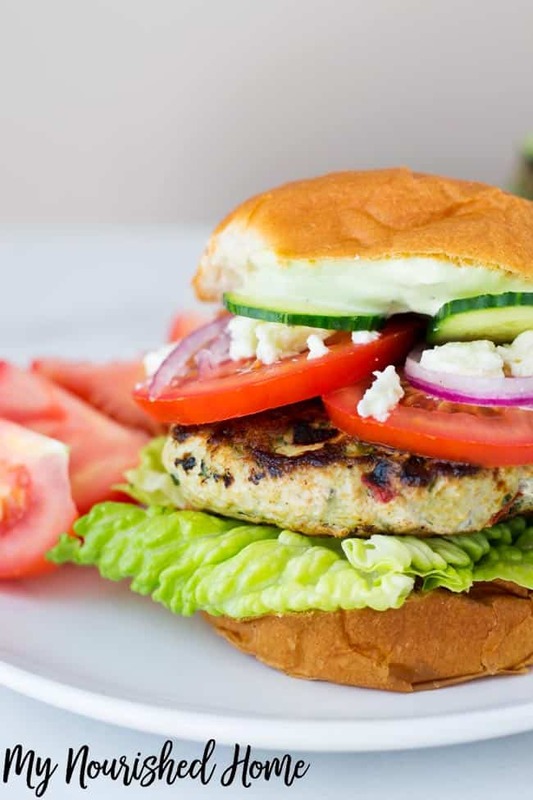 While chicken and veggies are a grilling staple around here, so too are burgers. 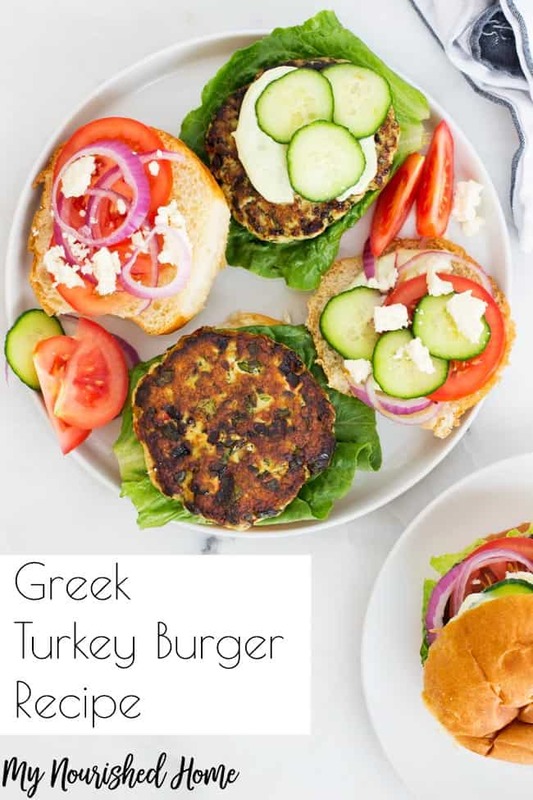 This scrumptious Greek Turkey Burger recipe is one of our favorites! My family loves cheese. American, cheddar, Gouda, pepper jack – you name it and they love it. However, their favorite cheese is, by far, the crumbly tastiness that is all things Feta. They use it on salads, in desserts, and have been known to snack on it right from the container. Since Feta cheese can be a bit high in sodium, I usually try to use it in moderation. When it comes to this recipe though, it’s full on Feta tangy goodness. Although I’ve indicated that the Feta is optional, we really do add about 1/3 cup of it to the burger mix before cooking. It’s absolutely delicious that way and has been known to please even the pickiest of little eaters. As you may know, we’re on a mission to make sure that there’s health benefit in every meal, so we pile these burgers high with vegetables. Tomatoes, sliced cucumbers, red onions, and some crunchy lettuce from the garden really make the burgers pop. We also grill corn on the cob or serve sliced vegetables on the side. It makes for a great summer meal with a lot of rich vitamins and nutrients. The recipe itself is super easy to make, but the majority of your time is going to be spent cutting the black olives, baby spinach, and roasted red peppers. It’s important to do a fine chop of them or your burger will end up with a lumpy, chunky texture that’s never appealing. If you have a food processor that chops, plug it in and use it; you’ll save yourself quite a bit of time! Just be sure to dry the baby spinach thoroughly so you don’t end up with a goopy mess instead of diced leaves. This recipe is so tasty that I even served it at a backyard barbecue with neighbors last year. I doubled the recipe and then made burger sliders that I knew would be a hit with the kids (and adults!) in attendance. So, if you’re looking for a delicious burger recipe for a Memorial Day cookout or a Fourth of July get-together, this Greek Turkey Burger recipe is a sure winner. If you make it, let me know what you think! Happy grilling! Looking for more great burgers? Try this burger piled high with sauteed onions and mushrooms. 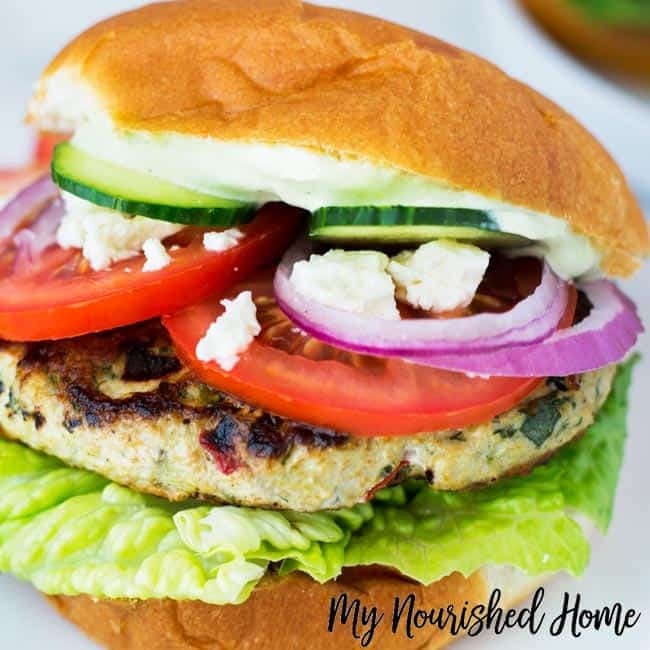 Or looking for a meatless Monday option – This Greek Salad Sandwich is awesome! In a large mixing bowl combine all ingredients thoroughly. Heat a large nonstick fry pan with 1 tbsp oil, over Medium High heat. Once oil is hot, shape mixture into 5 patties (should be packed decently tight to ensure they stay together) immediately add patties to pan. Cook patties 5 minutes per side or until center reaches 165F.